THE MOSS FAMILY SINGERS had its world premiere (as "UNBROKEN CIRCLES") as a guest production at the Odyssey Theatre in Los Angeles, CA. It opened on Jan 29, 2009 and ran for five weeks. It was self-produced and directed by Greg Phillips. 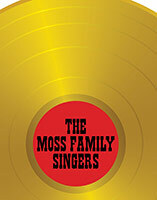 THE MOSS FAMILY SINGERS is a searing Southern drama that weaves a complex and compelling tale of a famous country music family in spiritual crisis. Set in a small town in North Carolina where three generations of Mosses have gathered for the 75th birthday of the venerable matriarch Mama Jo, everyone is pushed to their limit when she announces her plans to get the family back on top where they belong. Unfortunately, the clan members have their own agendas. Her daughter, rebel rocker Maggie, just out of rehab, for the third time, is determined to put her life back together no matter what the cost, and isn’t sure she’ll ever sing again. Niece Odena is so desperate to leave gospel music and reclaim her rightful place as the next leader of the family, she can’t even remember God’s name much to the embarrassment of her overly religious husband. Granddaughter Shelly is on her way to becoming the next big country star if she doesn’t kill her abusive, ex-marine husband first. Her other niece, the unmarried Booth, manages every aspect of the family member's careers and lives, even as she secretly copes with a life-threatening health crisis, and her sister and former singing partner, Mama Dot, will go to any extreme, including constantly popping nerve pills, to avoid reality and the long-ago buried truth of her life. We see the evening unfold through the bemused, and sometimes tormented, eyes of the men in their lives, including Mama Jo’s grandson (and Shelly’s twin) Sammy, a photographer who tries to make sense of the family through his photos. In the course of the birthday dinner and its aftermath, feuds are fought, rivalries are rekindled, and faith and sanity are tested as mothers, daughters, sisters, and cousins fight for the heart and soul of the Moss family. Mama Jo Moss - female, 75, the powerful matriarch of the Moss Family Singers. Maggie Moss - female, mid-40s, Mama Jo’s younger daughter. A country-rock singer just out of rehab. Sammy Moss - male, early 20s, Maggie’s son. A photographer. Shelly Moss - female, early 20s, Sammy’s twin sister, the newest singing star in the family. Charlie Davenport - male, early 20s, Shelly’s husband, who is a former Marine. Mama Dot Moss -Ledford- female, late 60s, Mama Jo’s sister. She used to sing with the family before having a nervous breakdown. Odena Moss -Ledford-Allyson- female, mid-40s, Mama Dot’s daughter. A gospel singer who has lost her faith. Dickie Allyson - male, mid-40s, Odena’s husband and pianist. Booth Moss - female, early 50s, the manager of the Moss Family SIngers whose father was an original member of the group along with Jo and Dot. Cleo Moss - female, late 70s, Booth’s mother who is in the early stages of Alzheimer’s. The Preacher (The Reverend Robert Parker) - male, mid-40s, a preacher Maggie met in rehab. Luke Stillwell - male, early 20s, Dickie and Odena’s assistant who is a student at the local Bible College..
Johnny Bill Crawford - male, late 40s, Mama Jo’s son-in-law who was married to her older daughter that was killed in a plane crash.